Duni Chand from Northern India undertook a fascinating effort to match paintings of the Western Himalayas by Russian artist Nicolas Roerich with photographs of the remote region. Take a look at the results. Even though long an admirer of Eastern philosophy, Russian painter and philosopher Nikolai Roerich only visited India for the first time in the mid-1920s after he fled Russia following the Bolshevik Revolution. He organized the Asian Expedition, which went through remote regions of north India, China, Tibet, the Altai Mountains and Mongolia. Roerich’s followers claim that during the expedition a number of geographic and ethnographic discoveries were made. In addition, he made about 500 paintings devoted to the Himalayan Mountains. 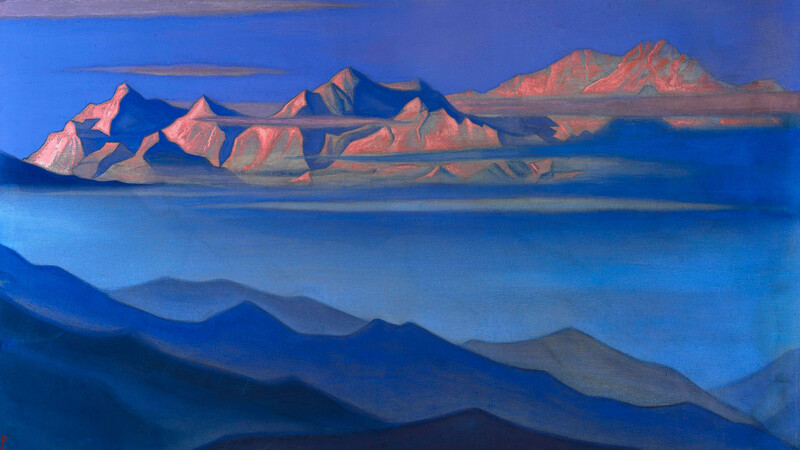 The Himalayas captivated Roerich, and he saw in them a deep spiritual significance, as well as one of Earth’s holiest places. After the Asian Expedition, Roerich and his family settled in the Kullu Valley in northwestern India in the very heart of the Himalayas. Roerich lived there until his death in 1947, and his family founded there the Himalayan Research Institute. “No painter depicted the mountains the way my father did. His Himalayas radiate the incomparable richness of light and color, as well as an inexpressible greatness and lofty thoughts,” wrote Roerich’s son Svetoslav, himself a renowned painter. “Where else could you find such joy in a sunrise as in the Himalayas, where blue is more intense than sapphires; where glaciers shine from the furthest distance like incomparable diamonds,” wrote Roerich, describing the mountains that fascinated him so much. In 1942, Roerich’s estate was visited by future Indian Prime Minister Jawaharlal Neru and his daughter, Indira Gandhi, another 20th century Indian leader. “It was a memorable visit to a surprising and gifted family where each member was remarkable, with a well-defined range of interests. ... Roerich remains in my memory a man of vast knowledge and experience; a man with a big heart, deeply influenced by everything he observed,” Gandhi recalled. Roerich considered himself to be a sort of bridge between the two civilizations – Russia and India. “I’m proud that I was destined to glorify the magnificent Sacred Himalayas in many paintings. Loving India, and as Russian, I’m happy that in the history of Russian art the Himalayas and India will be praised with love and respect,” Roerich said. In 2013, the British auction house Bonhams sold one of Roerich’s Himalayan paintings, “Kanchenjunga,” for 1.3 million pounds. That same year Bonhams sold another of his paintings “Madonna Laboris,” for 7.9 million pounds, making it the most valuable Russian painting ever sold in a Russian art auction.